Abidjan - Cote d'Ivoire — ECOWAS has followed with keen interest the inclusive discussions between the Malian parties in Ouagadougou resulting in the signing of the Preliminary Agreement for the presidential election and inclusive peace talks in Mali. The ECOWAS Council of Ministers believes the signing of this Agreement on 18 June 2013 represents a major step towards peace. Consequently, it expresses its hope that this Agreement will create the necessary favorable conditions for the holding of the presidential election of 28 July 2013 throughout the national territory of Mali. In that regard, Council strongly urges all the Malians to accept it and strictly comply with the spirit and letter of the Agreement, and ensure its implementation with a view to strengthening cohesion and national unity. In particular, it calls on all the political party leaders, opinion leaders and all the active forces of the nation, civilian and military alike, to avail themselves of this good opportunity to find a definitive solution to the crisis. At this crucial point in the peace process, Council strongly urges all parties to work together in consultation with the transitional authorities to consolidate the achievements hitherto recorded. In particular, the Council calls on all to rise to their individual and collective responsibilities in the supreme interest of the Nation, and refrain from statements and/or actions liable to compromise the peace process underway. The ECOWAS Council of Ministers pays well deserved tribute to the ECOWAS Mediator for Mali, H.E Blaise Compaore, President of Burkina Faso and the co- Mediator, H.E Goodluck Ebele Jonathan President of the Federal Republic of Nigeria, as well as the current ECOWAS Chairman, H.E. Alassane Ouattara, for their continued efforts and untiring commitment that have been consummated by this Agreement. 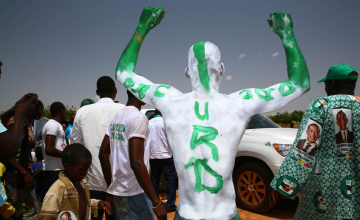 With some reports of intimidation and interference by religious authorities, an increasing number of political groups have warned against possible fraud as Malians go to the polls to elect a new president. Council commends the team spirit and the willingness demonstrated by all stakeholders in concluding this important and historic agreement, and urges them to maintain this spirit in continuing the inclusive dialogue necessary for the reconstruction of a renewed, sovereign and prosperous Mali. Council expresses gratitude to the entire international community, all ECOWAS partners, particularly France, the United States of America, Switzerland, the African Union, the European Union, the United Nations, as well as frontline countries for their constant support and assistance, without which the agreement would not have come into being . Council reiterates the total availability and the determination of ECOWAS and that of its Member States, to support the Government and people of Mali in the process of consolidating sustainable peace in the country and the region.